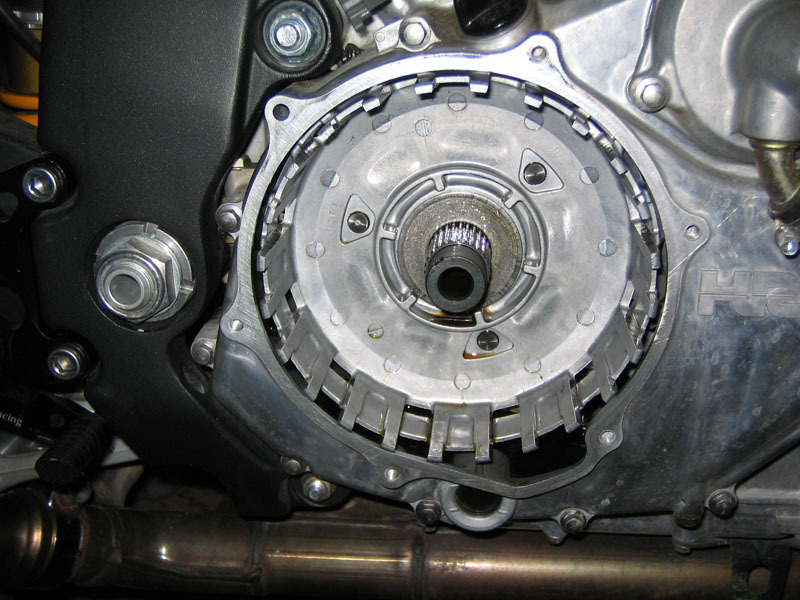 Technical Car Experts Answers everything you need: how to remove the clutch nut on honda motorcycle? 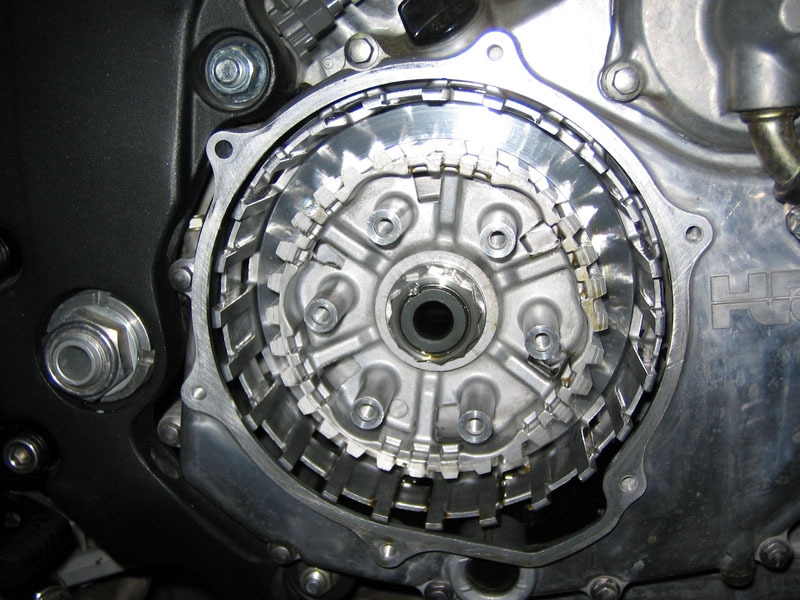 how to remove the clutch nut on honda motorcycle? 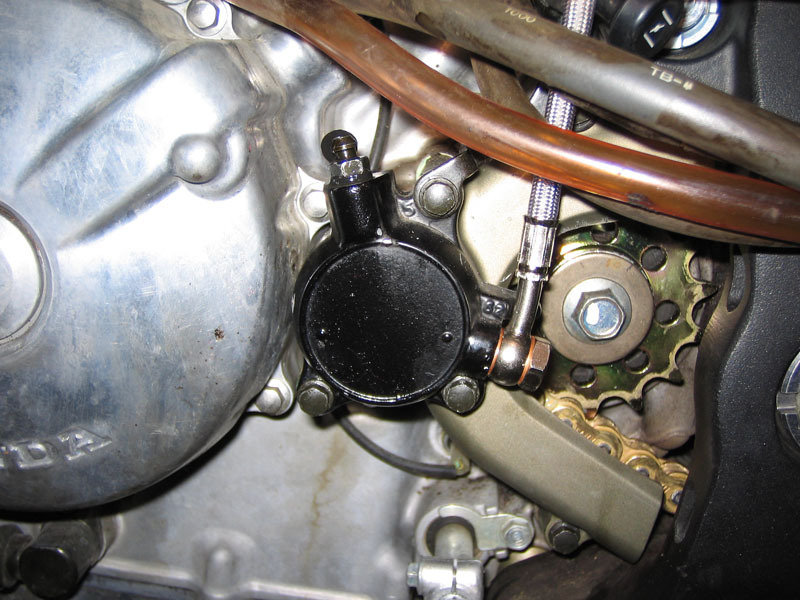 First, remove the clutch slave from the left side of the bike so that the lifter rod doesn't shoot out and take an eye out. Ok, chances are that won't happen, but lets get the pressure off of the back of it anyways. There are 3 8mm bolts holding the slave on, and one 8mm bolt holding a bracket that has to be loosened to release the top of the slave. You can let it hang there. The goal is just to release the pressure. 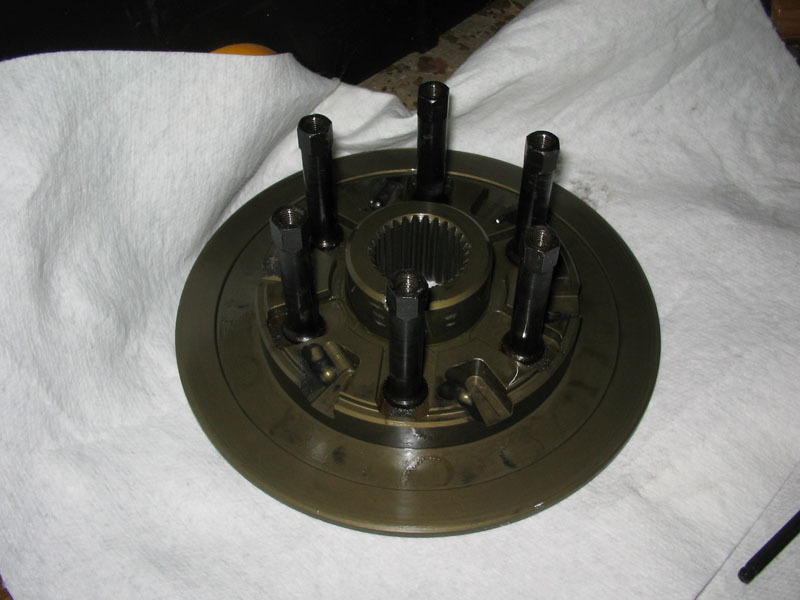 Next, remove the six 8mm bolts holding the clutch cover on. Gently remove the cover and secure the o-ring. It is recommended to replace this o-ring after removal and mine was stretched after removal anyways. It is up to you if yours is in good shape and you want to reuse it. Remove the six 10mm bolts and springs that hold the pressure plate in place. 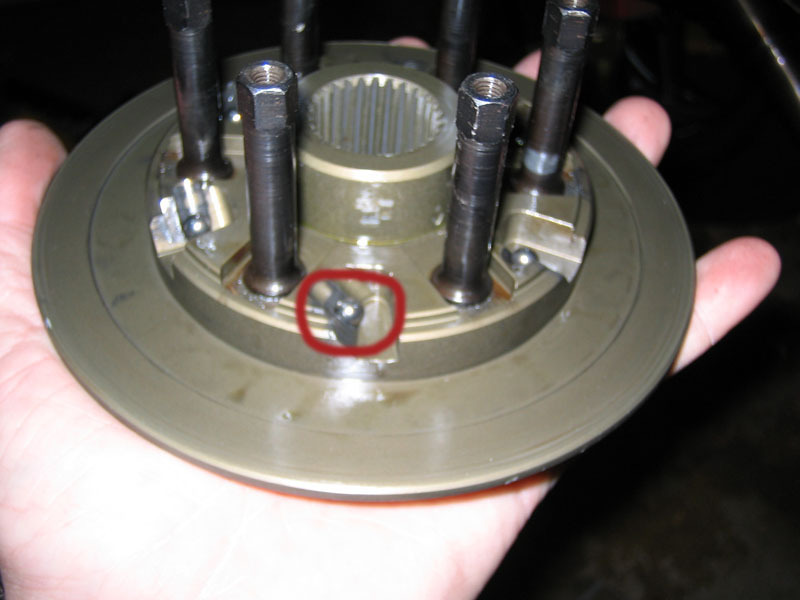 Next, remove the lifter piece and lifter rod from the center of the clutch assembly (circled in red above). 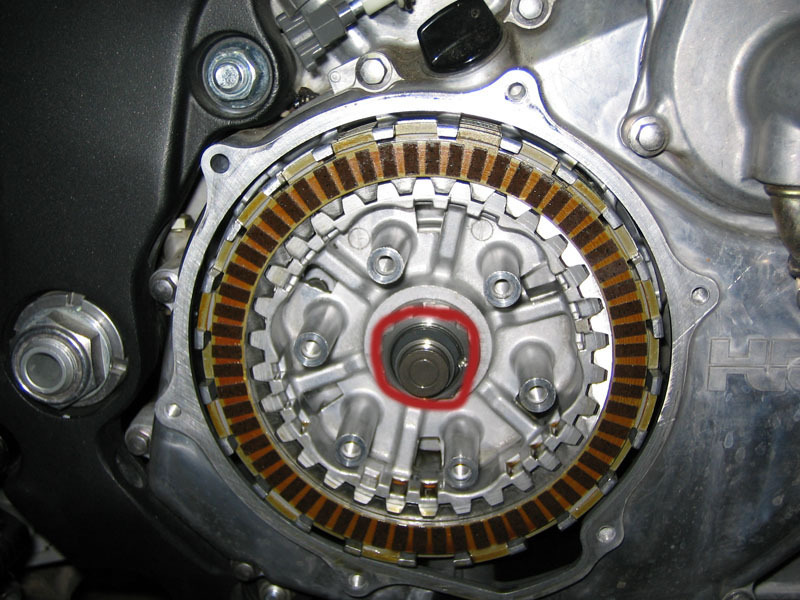 Remove the seven clutch discs and six plates from around the clutch center. Keep them in order to make reinstalling them easier. Unstake the clutch center lock nut. This can be a little tricky. I ended up digging deep into my toolbox to find a tool able to get underneath the stake and pry it up enough to clear the lug. Then remove the 30mm clutch center lock nut. You can use the special Honda tool (or 3rd-party equivalent) to lock the clutch center in place, make one from instructions off the internet, or use an impact wrench at about 50psi and knock that puppy loose! I did the latter (thanks abtech!) and it came off without too much trouble or time. Remove the clutch center and special washer that was underneath the lock nut. Make sure that the thrust washer stays in place. 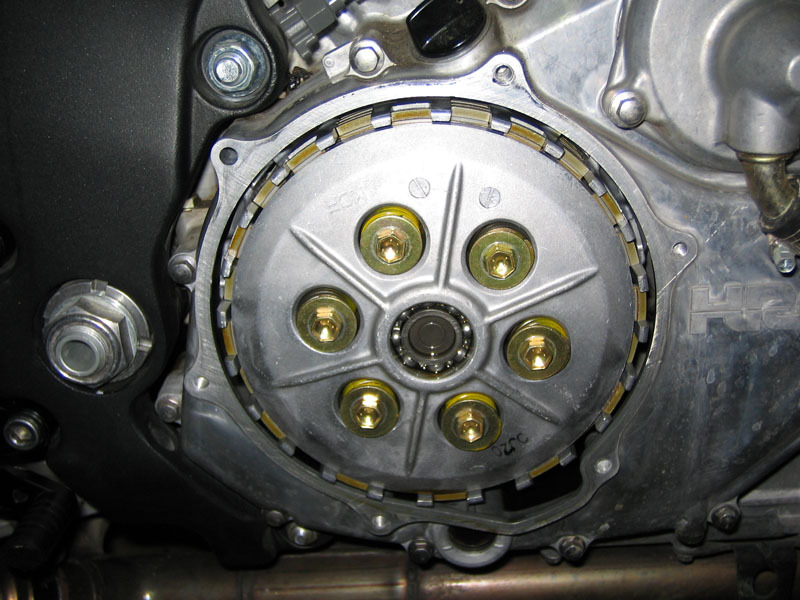 Install the studs on the JTR clutch center. They are reverse threaded and have 7mm heads. I donm't have torque specs on those so I tightened them by feel. Next, install the new clutch center, slipper bearings, clutch center upper, and spider spring. I found it easier to preasseble everything on a horizontal surface because the bearings tend to run on you. 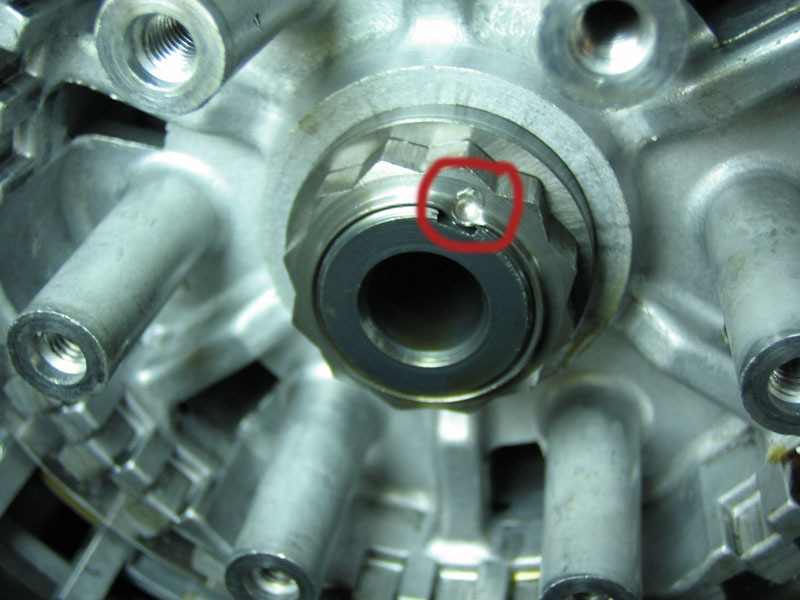 Make sure that each of the six bearings stays (circled in red below) in its raceway as you install the upper over the studs. Then drop the spring in place. Hold the whole assembly together and slide it in place. 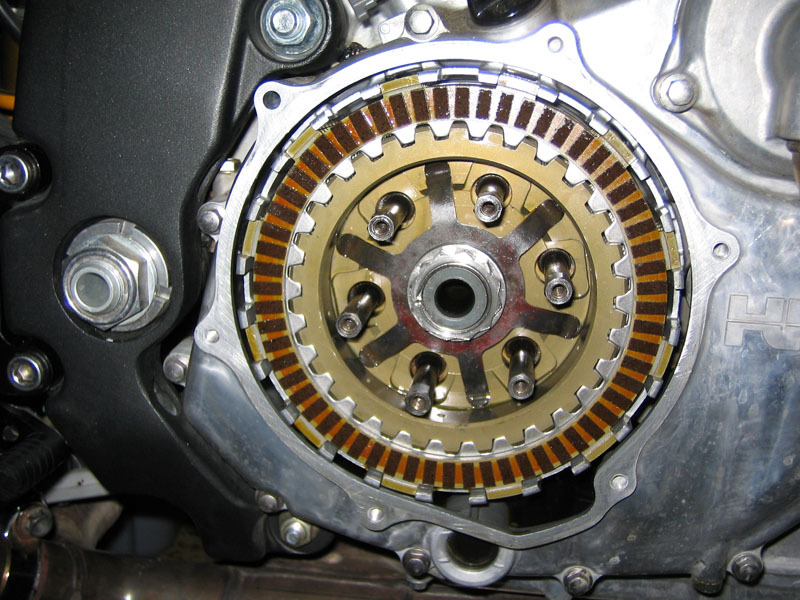 Install the special washer and the new lock nut on and run it in to keep the clutch center assembly in place. Lock the clutch center in place and torque the lock nut to 94 lb. ft.
Reinstall the clutch discs and plates in the same order you removed them, remembering to install the top plate in the shallower grooves. Reinstall the lifter rod and lifter piece making sure to reinstall the rod the correct direction. 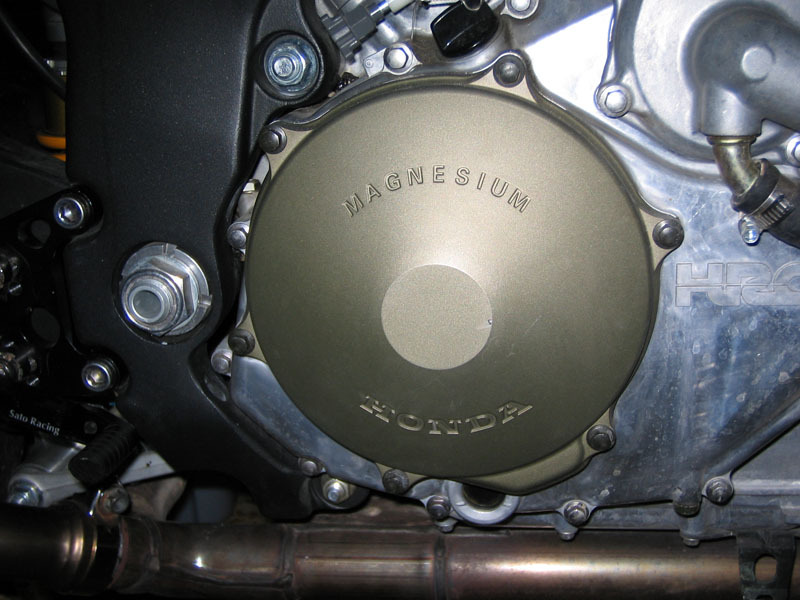 Install the pressure plate and hold in place with the six 4mm allen head bolts and springs. Bottom the bolts out and give it a turn to make sure they're tight (thanks greyhound!). Any more and you're buying new bolts! 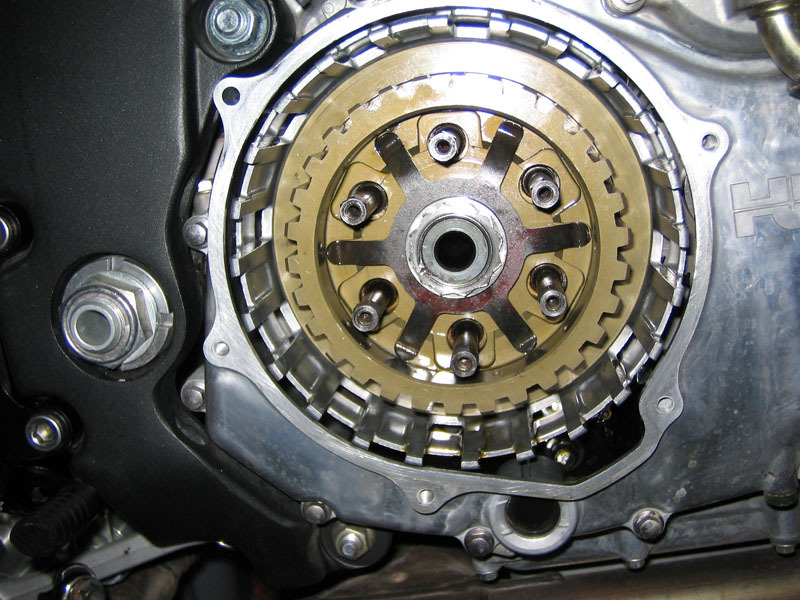 Reinstall the clutch slave and tighten them down. Bleed your clutch line to make sure that no air got in during the installation. 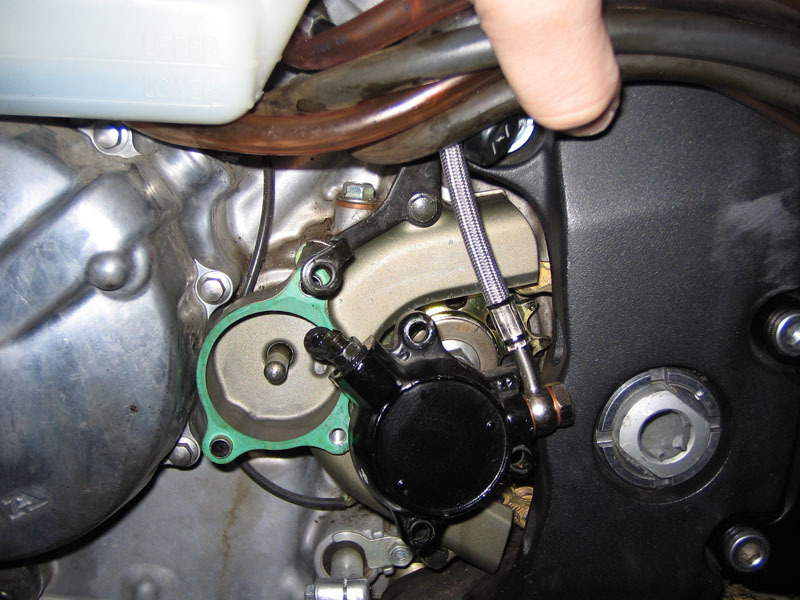 Give the clutch lever a pull and visually make sure that the clutch basket releases. 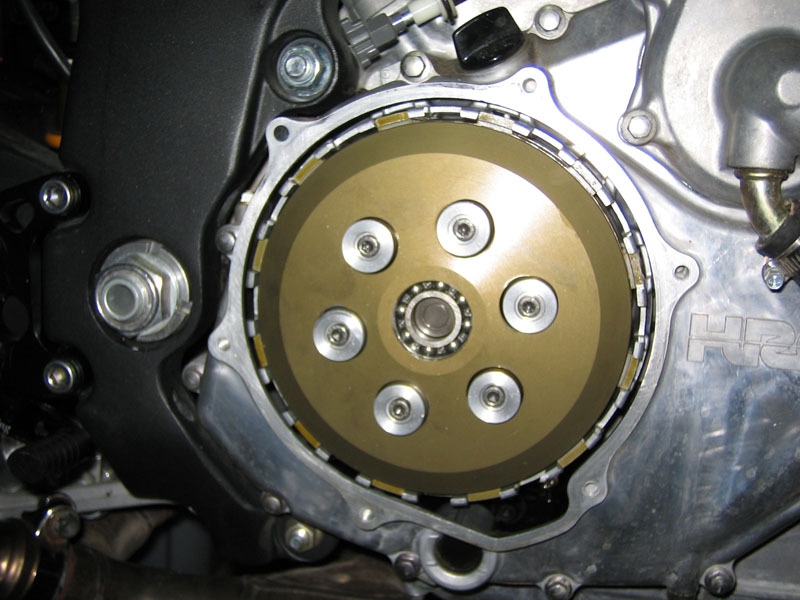 Reinstall the clutch cover with the o-ring and tighten the six bolts in a crisscross pattern. Labels: how to remove the clutch nut on honda motorcycle.